At the other end of Stokes Bay is the Royal Navy Submarine Museum where JIM has been a resident for many years. JIM is an atmospheric diving suit (ADS). 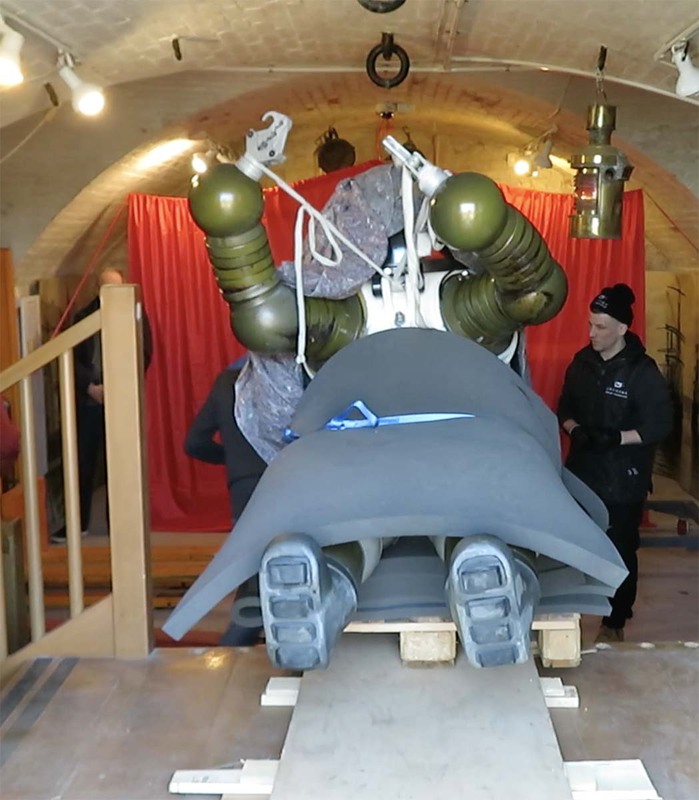 You could describe it as a man-shaped submarine – in other words, the diver does not need to decompress when exiting JIM after a dive. 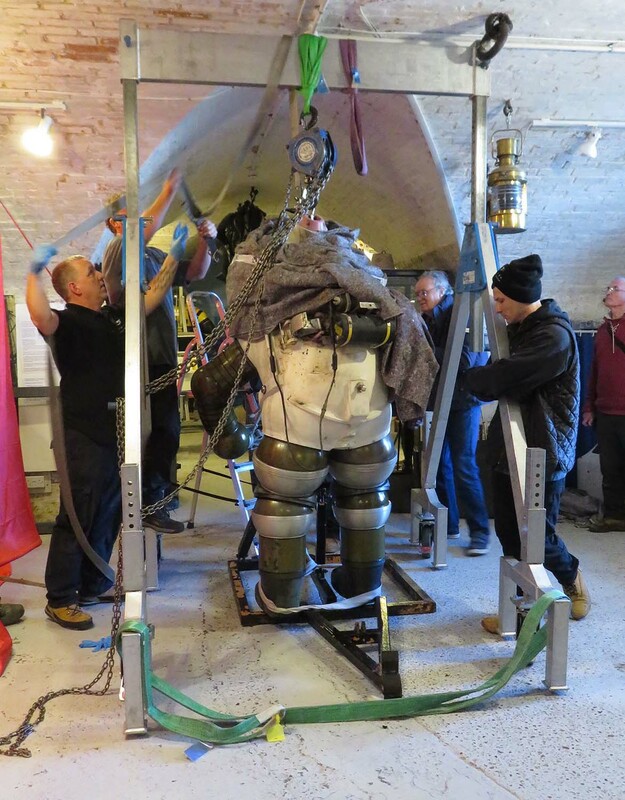 JIM was invented and built by Mike Borrow and Mike Humphrey of UMEL (Underwater Marine Engineering Ltd) in 1969. Inspired by an earlier British ADS, ‘Tritonia’, JIM was completed in 1971 and tested to 300m (1000ft) at Admiralty Underwater Weapons Establishment in Dorset. During the ensuing years JIM was modified several times – later models were able to descend to 500m. 19 JIM suits were made (ours is JIM 18) and were mostly used in the offshore oil industry. JIM also played a starring role in 2 movies including the Bond film, ‘For Your Eyes Only’ in 1981. The Royal Navy Submarine Museum have loaned JIM to us as we can offer him a place indoors protected from the ravages of the weather. But his journey, though sort in terms of miles, was a triumph in terms of getting him into our Victorian Military Battery where room to manoeuvre is at a premium. Thanks to the truly extraordinary efforts of the crew from Jayhawk, JIM is now standing alongside the Newt Suit whose development was inspired by JIM. 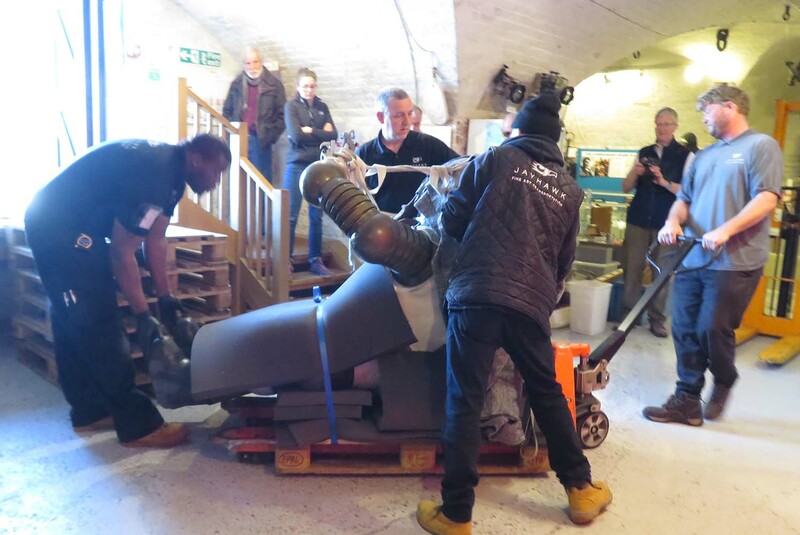 As a new member of our diving family JIM will be carefully preserved and protected. We are lucky to have Richard Castle, a former JIM engineer, as one of our volunteers so we know JIM will be in good hands.